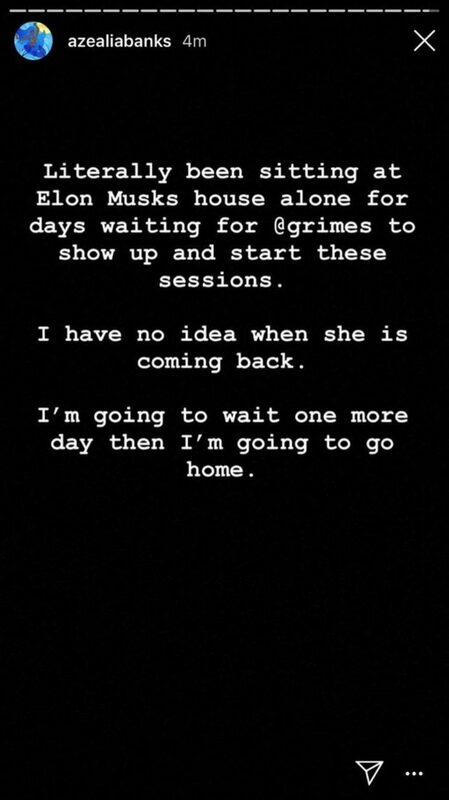 Even though Azealia Banks terminated her album Fantasea II: The Second Wave last month in hopes of recharging her musical drive, the embattled star signaled a possible return to the studio when she claimed this past weekend that she had been camping at Elon Musk's house. Her reasoning? To collaborate with Canadian singer (and Musk's girlfriend) Grimes. Later, a vexed Banks returned to IG and compared her stay at Musk's house to Jordan Peele's 2016 film Get Out. “Staying at Elon Musk’s house has been like a real life episode of Get Out," she wrote. According to NME, last month, Banks beamed with joy on Twitter after learning she was going to collaborate with Grimes. "Omg I'm listening to f2!!! All the songs are finished except lorelei and grimes song. I have a session next week with Alex Carapetis to lock lorelei down. Then I go to LA to finish grimes and oh yes!! Finish Paradiso two! But daaaaaaaamn there's some heat!" Hopefully, Banks can nab her elusive collaboration sooner than later.